University Provost Earl Lewis spoke to the gathering about the strategic plan. Emory’s first international advisory board, the Europe, Middle East, and Africa Board, met for the second time in June at Ciragan Palace in Istanbul, Turkey. Since its inception last fall, the board, made up of leaders in a range of fields from throughout the region, has been working to raise Emory’s profile on the international scene. Like the inaugural meeting last October in London, the gathering was marked by lively discussion and fresh perspective from board members. The group discussed how to enrich the University’s ties in Turkey through cultural collaborations and events, including future exhibits of Turkish treasures at Emory. Leaders from Koc University and Bogacizi University also were consulted as partners in these efforts. Expanding Emory admission internationally was a popular topic; board members suggested mapping out targeted countries and identifying key advantages to international students. They also spoke of helping to develop student internships and overseas jobs. Board member Mona Diamond, Turkish Honorary Consul General for Georgia, said she will continue to work with both private and public high schools in Turkey to raise awareness of Emory among students. “It is up to us to promote this outstanding institution and bring students from all over the world to receive the highest educational standards,” she said. 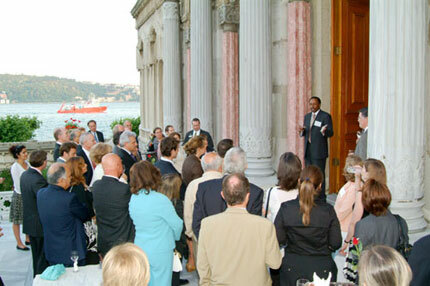 The meeting was followed by a reception for the board, alumni, and friends, where some eighty-five guests had an opportunity to connect in the palace setting. During the reception, Can Aydemir 02B announced the formation of the Emory Alumni Chapter of Turkey, which already has drawn forty-five members. A new web page devoted to the chapter can be viewed at www.alumni.emory.edu.